Preheat oven to 180°C. Line a 27cm x 18cm x 3cm tin with baking paper. Prepare base. Combine dry ingredients and melted butter, mix well. Press mixture into tin. Bake in preheated oven for 10 minutes. While base is cooking, prepare topping. Place condensed milk and eggs in a large bowl and beat well for 1 minute. Add lemon rind, lemon juice and flour and beat until combined. Pour over base. Return to oven and bake for a further 20-25 minutes or until topping is set. Allow to cool in tin. Cut into pieces and sprinkle with icing sugar before serving. 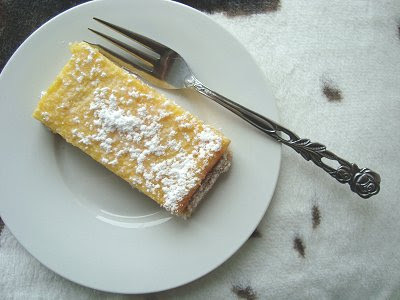 If desired serve with lemon zest and dust with icing sugar. I just KNOW I will love that! Lemon + Condensed Milk = always divine! Yummo! Gotta give that one a go! Lemon and condensed milk two of my favourite foods. Your temptation is too much....I'm still dreaming of those coconut ice balls that I still haven't got around to making yet. Yummy! I saw a recipe for a frozen lemon cream pie that I'm going to have to try soon. Now, I have this one too. how lovely to have lemons growing locally! I was just yesterday looking at the lemons on my tree wondering how many lemon honey drinks I would have to drink to consume ALL those lemons. Thanks you have saved me and expanded my lemon recipes by one. Will have to check out the link to last years lemony things galore.